Last year, the City of St. Petersburg reported 27 new developments were either underway or recently completed. Peter Belmont of Preserve the Burg, a historic preservation group, told the Suncoast Tiger Bay Club gathering that preserving existing buildings is better for growth than the high rises popping up in downtown. Belmont was joined on the panel by Alan DeLisle, the City of St. Petersburg City Development Administrator, Elihu Brayboy, owner of Chief’s Creole Café, and developer Mack Feldman of Feldman Equities. They discussed controversial projects such as ONE St. Petersburg - currently the tallest building in downtown. Preservationists challenged the city about the height of the building owned by the Kolter Co., and others worried the condominium would drive up rental prices. The city eventually allowed for the project to be at its planned height, but under conditions that promoted preservation, said Feldman. Feldman believes that there is a place for both preservation and development in the city. He also said that with the amount of people moving to the area, development is necessary to accommodate everyone. “We have to allow supply to keep up with demand,” he said. For Brayboy, a business owner in St. Petersburg’s historic Midtown neighborhood, development looks a lot like pushing low- and median-income residents out in the name of growth. Brayboy pointed to the demolishing of the primarily black neighborhood in the city’s Gaslight district in the 1980s to build Tropicana Field and to the the removal of residential homes on 22nd Street South to build the Job Corps facility. Expansion of city development, Brayboy said, doesn’t sound like it will be good for the community in which he lives and works. City Development Administrator DeLisle said that the city is working hard to make sure St. Petersburg works well for all of its residents, current and future. Community members also weighed in on the debate. Matt Weidner is an attorney who represents a resident trying to demolish and rebuild his home in the historic Driftwood neighborhood. He said preservationists don’t take individual rights into consideration. “One of the most frustrating things about the preservation argument and debate is that the proponents of preservation have no concern whatsoever for the financial consequences of individuals,” he said. 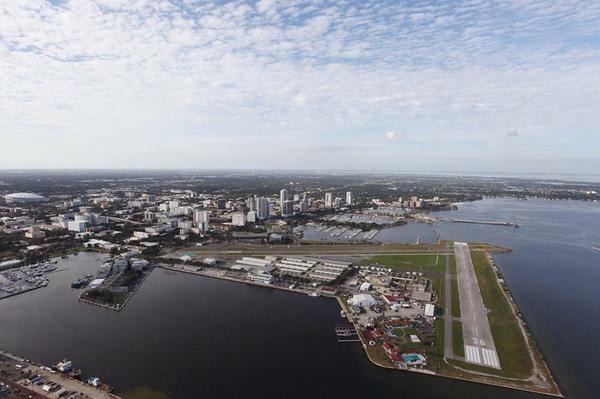 Beth Connor, a candidate running for St. Petersburg City Council, said she wished developers and preservationists would focus more on areas on the city’s southernmost side - the Skyway Marina District and the Pink Street neighborhood. “There’s adaptive reuse of buildings in my district. There are lots that can be repurposed for things. There’s housing stock that can be renovated and reused,” she said. No two opinions seemed to agree completely, but community members who attended the event did feel like they had more insight into the city’s future. Monica Kile, a member of the Suncoast Tiger Bay Club was happy with the conversation.